You may have heard of Shui Hau Wan on Lantau Island, which is a popular location for clam digging and kite boarding. Shui Hau is actually an important wildlife habitat housing a wide range of precious species, including the 'living fossil' horseshoe crab. However, trash left behind from visitors, as well as marine debris is one of the major threats to the juvenile horseshoe crabs living in the mudflat. 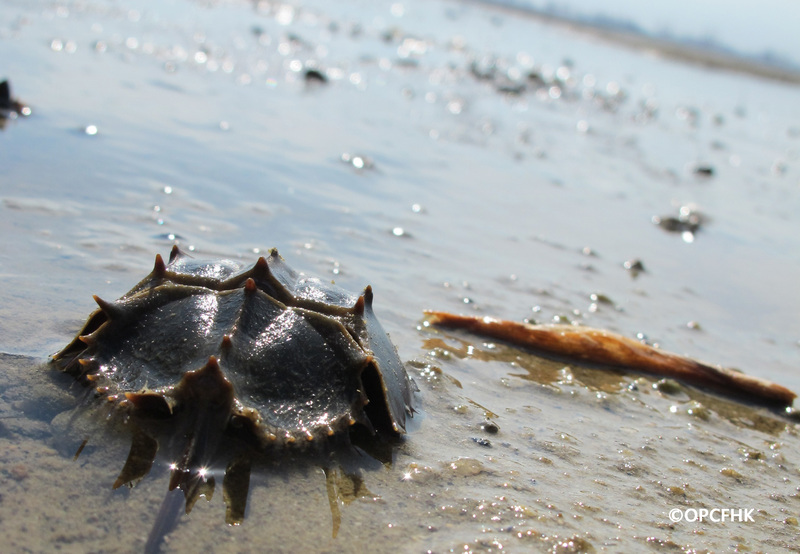 To learn more about the features of the ‘living fossil’ horseshoe crab, their importance to humans and how their habitat is being affected by human activities, please join the mudflat clean-up organised by Friends of the Foundation. Together we can restore the habitat of horseshoe crabs and inspire future generations to build a harmonious relationship with the Nature. Interpretation is conducted in Cantonese with supplementary in English；persons aged 4 or above are welcome；seats are available in first-come-first-served basics. Please fill in the enrollment form and return to OPCFHK by fax or email. Special Offer for Friends of the Foundation! Donate HK$200 (Regular Membership) or HK$80 (Junior Membership) to join Friends of the Foundation and participate in our regular conservation activities! Please click here for details of the membership. Join Friends of the Foundation and register for the restoration of the natural habitat of horseshoe crabs!